Max's IEP triennial meeting is coming up. This is when every 3 years, everyone in Max's education teams observes, do assessments and set goals for Max's education. We did this in first grade when the whole school experience was brand new. Max has not been a fan of the assessments, and I have to say, I'm not a fan of any of it really. It's not the school staff, or his teacher, they are amazing. It's just the process, that kick-in-the-gut-reminder that wait, he's different. So very different than children his age. Yesterday, that came to a head for me with the school psychologist while filling out the survey of his abilities, and functionality. Seven pages of "0" - "not at all able to do it" was filled out by me. Sometimes I laughed at the idea of Max looking up a number in a phone book...no one does that anymore. Sometimes I was proud to say, "yes he does that! "; like offering opinions on social subjects and current events. But mostly, I fought back the lump in my throat at all the things he doesn't do. It's a ridiculous "test", and one that left me in a funky funk all day. It's enough to make you think, this extra angst doesn't seem worth it. Then, days like today happen. Today, was Max's school's annual Pumpkin Run. 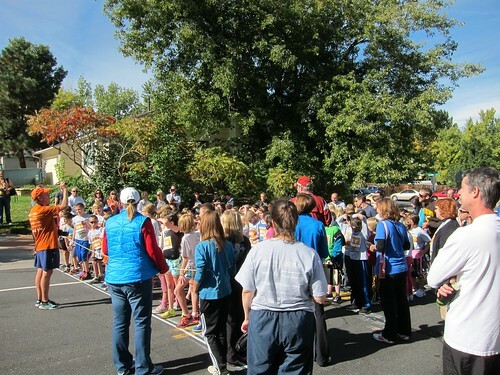 It's a huge event at the school to get kids out and running, for FUN! 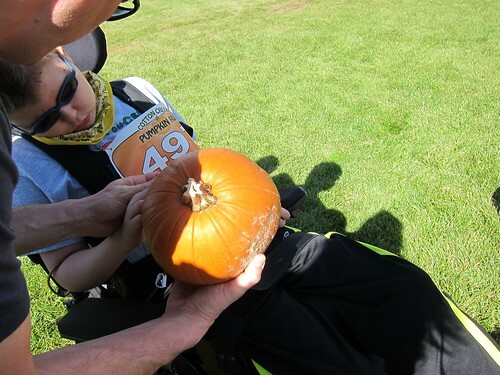 Max has never been able to make the Pumpkin Run, because it's either been too cold, too early, or he's been sick. Today, was a perfect day and he was excited to go run with his friends! 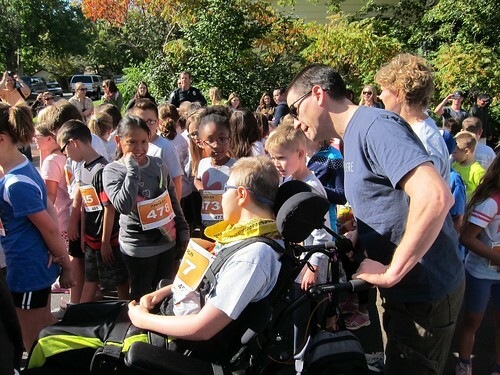 Max's grade ran 1 mile, and knowing his classmates would want Max to make that whole time with them, Steve stepped up and ran the mile pushing Max. 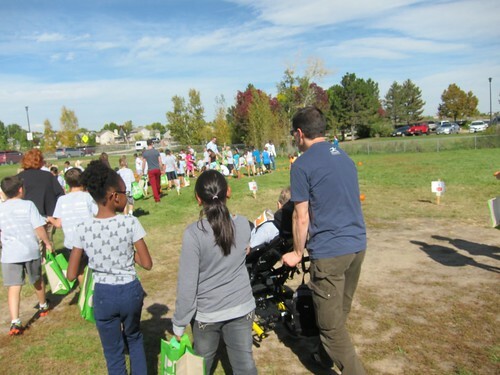 As the 4th graders walked up to the starting line, Max joined them. They lined up and Max's classmates gathered around him. Here they are all ready to go! Max and Daddy came around the first lap with Max's buddies hanging close by and taking turns pushing his chair. 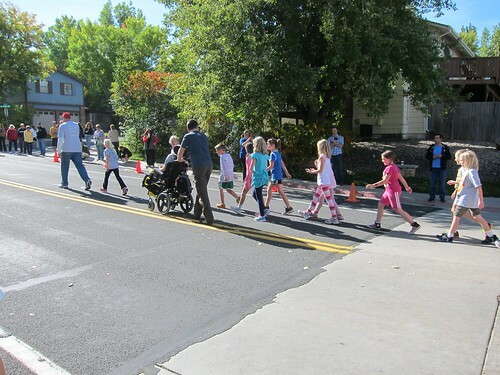 I walked around to the finish line and watched as Max's classmates started finishing their race. I heard a lot of cheering around the corner and saw Max coming along with his friend Will pushing him to the finish. They walked in the last bit of the race, and were being ranked. Steve was trying to let Will ahead, when I heard Will telling the race ranker "No, Max was ahead of me!" He made sure that Max got a ranking ahead of him because he had pushed him in, so Max was ahead of him at the finish line. That left me with a very different kind of lump in my throat. What a great friend! 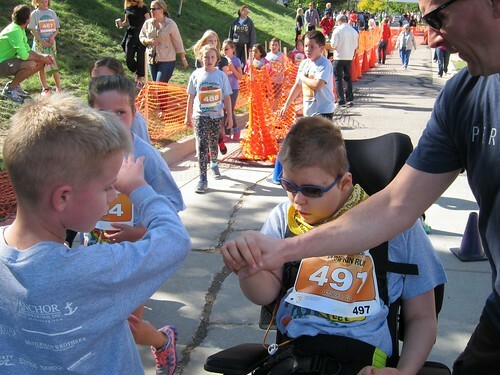 They gave high-5's at the end of a great race! After cooling a bit from their run, the class made their way to the playground to pick out a pumpkin. Max's other running partner Miss O led him over to the pumpkins and saved him a good looking one while we visited with his teacher for a minute. I'd say, yes...it is all worth it. THIS is school for Max. Not assessments of his abilities and functioning level based on 15 year old tests. THIS is why we do it. So wonderful to see you, and had a GREAT time in the sunshine. Congrats to Max on his first mile race! All the kids were amazing. I really appreciate your "take" on the day today and how it is important to remember what really matters! Lump in the throat, tears in the eyes here. I love that boy, his friends and his school! So glad it worked out that he could go this year! Sounds like everyone had fun. Wonderful story -- I know that feeling that you had doing those silly tests, and I'm glad that you're pushing it aside in favor of the reality that Max is included, loved and learning. can't wait to see you all again! !